Created to help promote Unilever’s “Bertolli Nights in” contest promotion featuring celebrity chef Rocco DeSpirito, people enter the booth to record a description of their ideal “night in”. The person with the best story wins “full star treatment from Bertolli in Hollywood”. I wrote the software portion of this booth. 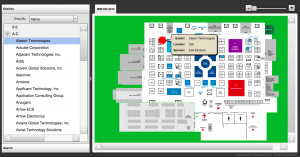 MapperActive is software for navigating an event or conference. I provides an informative, interactive view of the conference floor that can be used in touch-screen kiosks, your phone, or pretty much any device. It was in active development for many years, but has since been discontinued. Created for Alliance Tech, this application processes RFID data tracking the activity of attendees at an event, presenting visual replay of attendee movement as well as heat-mapping the popularity of sessions and exhibits. Created for Alliance Tech, this application reads RFID data in real time to present nearby attendees with information relevant to them and others around them.